It's that time of the year again! 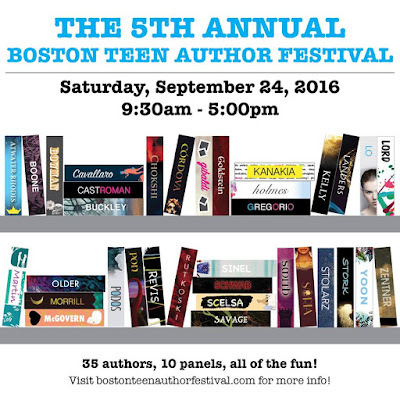 Boston Teen Author Fest Time! Every year the BTAF comes up in September, and every year it gets bigger and bigger. This year they had 35 Authors on panel, and that's not including the moderators and local authors that came for funsies and support. It's gotten so big that they had to expand to the neighboring school building to fit everything! This year I volunteered as a glorified hall monitor/ traffic person, and it was very interesting seeing things from the other side of the event. The planning and stressful behind the curtain type of thing. Renee is crazy amazing and takes on SO much work, she deserves such a huge round of applause. Who Run the World? (Flawed) GIRLS! Female Friendships: Does Growing Up Mean Growing Apart? I peeked in on a few to check out the turn out and WOW. Just wow. The amount of people that came, and kept coming throughout the day blew my mind. Carolyn, who I had met at Sabaa Tahir's signing came all the was from NH at 3 o clock in the morning! Such dedication! I already can't wait for next year! I wonder what authors will come then! But in the mean time. I will be moderating a panel at the Boston Book Fest Ocotber 15th. It has some amazing authors on it and we'll be discussing Complicated Relationships of all kinds!